Option 1: In kit form with quality potting soil, organic soil conditioners and a mix of seasonal vegetable seedlings. Option 2: Planted up and ready-to-go, with seasonal vegetable seedlings supplied with the kit from Option 1. Option 3: Unplanted, no kit form, just the planter. 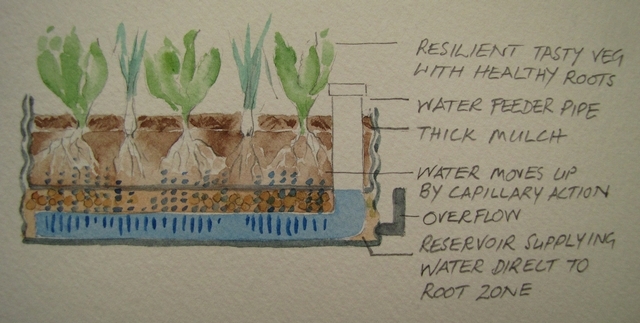 A built in reservoir at the base of the planter enables the veggies to grow with a consistent water supply at their root zone, reducing stress episodes to the plants. There is no loss of water to wind, run off, seepage or evaporation. Watering is infrequent, saving time and energy, making them ideal for public spaces, like schools, community gardens and offices, or for those who travel a lot. These small, lightweight planters (due to a special aggregate used in the reservoir that is light and porous, which assists with the capillary action of the water up into the soil) can be moved around according to Winter & Summer sun patterns in your garden. They are neat and aesthetic, suitable for balconies and stoeps, or close to the kitchen door. They are ideal where the ground is inpenetrable due to invasive tree roots or underground pipes. 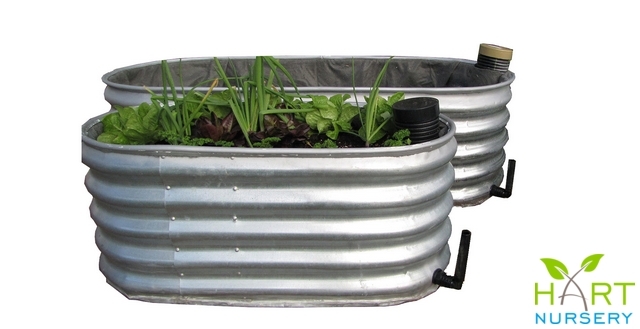 The raised planter means they are easier to maintain and less accessible to pets! Plants are healthier and more resilient due to strong root systems and no overhead watering ensures leaves stay dry and free of fungal issues.